These days, due to the spread of computers, tablets and smart phones, almost everybody types. But most modern-day typists are self-taught and have adopted "nonstandard" styles that are much different from the "touch typing" taught in typing classes. Three years ago, after completing a study that found standard touch typists can't identify the positions of many of the keys on the QWERTY keyboard and novice typists don't appear to learn key locations in the first place, Centennial Professor of Psychology Gordon Logan, research assistant Jana Ulrich and doctoral student Dakota Lindsey at Vanderbilt University began wondering how effective these nonstandard typing techniques were and whether today's keyboardists would benefit from taking typing classes in elementary school. So they conducted a study with 48 participants, half of whom reported they were standard and half of whom reported they were nonstandard typists. The results are described in the paper "Different (Key)Strokes for Different Folks: How Standard and Nonstandard Typists Balance Fitt's Law and Hick's Law" published online Oct. 17 by the Journal of Experimental Psychology: Human Perception and Performance. "According to basic psychological laws that govern fine motor skills, the typing style that uses the most fingers consistently should be the fastest and most effective," said Logan. 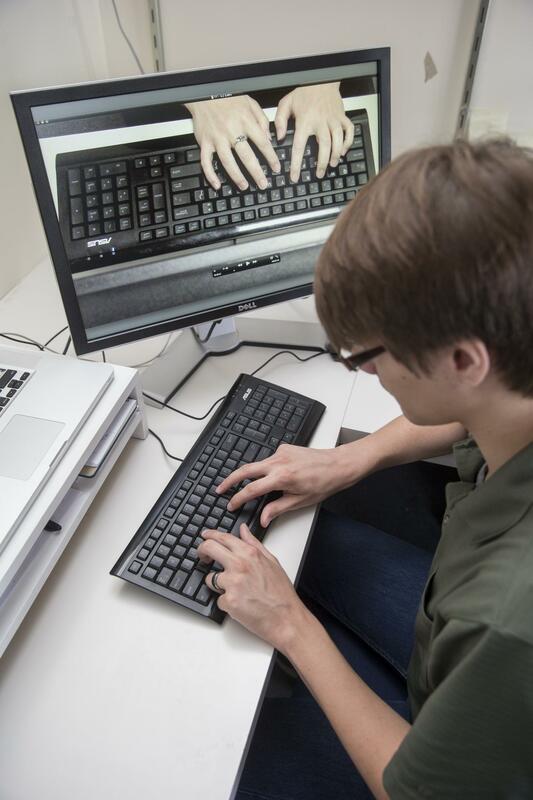 "Our study confirmed the theory by determining that touch typists have a definite edge in speed but we also found that nonstandard typists can type almost as quickly and accurately as touch typists as long as they can see the keyboard." In their tests, standard typists averaged 80 words per minute compared to 72 for the nonstandard typists. "We even had one two-finger typist who could manage 60 words per minute. That is good enough to pass a typing proficiency test," said Logan. In addition, the researchers point out that most of the typing people do these days involves composing messages, not directly copying printed material, which is the basis of typing speed tests. In an unpublished test, they found that a skilled typist who could type at 78 words per minute slowed down to 45 words per minute when composing messages. This suggests that the speed difference between standard and nonstandard typists probably does not have much impact on messaging and similar activities. Based on their results, the researchers question whether schools should invest in teaching typing to children at an earlier age. "The benefits of earlier training may not be large enough to outweigh the costs the typist and educational system would have to pay," Logan said. "Similarly, our results raise the question of the value of remedial training for nonstandard typists." One of the surprises the researchers got was the discovery that 14 of the 24 typists who said they were standard typists were actually nonstandard typists. Citing another study that found 90 percent of its subjects were nonstandard, the researchers commented, "Perhaps standard typists are a rare breed." The researchers tested the keyboard knowledge of both groups and found them both to be incomplete and inaccurate. Standard typists, on average, could correctly identify 17 keys, got four incorrect and omitted five. Nonstandard typists correctly identified 15 keys, got seven incorrect and omitted five. "Neither group had enough explicit knowledge of the keyboard to support their demonstrated speed," the researchers state. "Both groups seem able to type without thinking about letters, keys and movements, having handed that off to the motor system." By analyzing how the typists' performance changed when the keyboard was obscured, the researchers discovered that the nonstandard typists rely on their vision much more than standard typists. When the keyboard was obscured the speed and accuracy of the nonstandard typists dropped while that of the standard typists remained about the same. Although this reliance on vision increases the nonstandard typist's speed, it does come at a cost. For example, the nonstandard typists can't watch the keyboard and screen at the same time, and spotty monitoring of the screen could mean that they don't catch as many errors as they type. According to the researchers, how significant these costs are is a matter for future research. The study was supported by National Science Foundation grant BCS 1257272.